There is an area within the block where the oil galleries and the cooling water passages are very close to each other. If at any time in the past, the engine has been neglected it is possible for the block to corrode to the extent that this area becomes porous, allowing the oil, being at a higher pressure to enter the coolant passages. 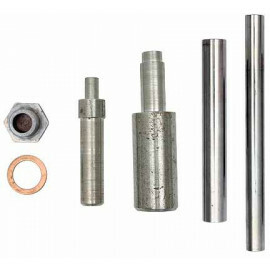 The solution that we have developed for this problem is to reinforce the areas of the block that are susceptible to corrosion with seamless stainless steel tubing. This allows the repair of otherwise unusable blocks and will also prevent the problem from occurring in blocks that currently appear sound.